The First Human Resource Standard! Based on four years of research, the standard is designed to suit the full array of organisations - profit, not for profit, government, private, large and small. The National Human Resource Standard is a blueprint, assuring sustainable human resource practice for future organisations. The official market launch was held in Melbourne on the 17th of February. The event explored the National Standard document, its application as well as case study organisations that have adopted NS HRF-101:2010. To download the white paper Setting the Standard – The Standardisation of Human Resource Frameworks click here. 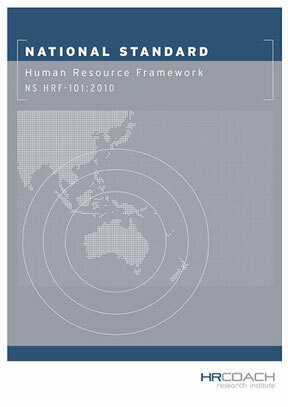 To purchase a copy of the National Standard; Human Resource Framework NS HRF-101: 2010 or for further information please click here. Sponsored by HR Coach and developed by representatives of industry across Australia, New Zealand and Asia Pacific including the University of Queensland, ASB Bank, Australia Post, Griffith University and Legal Practice Managers Association of Australia, it provides consistency and security in human resource practices that organisations have now come to need.